Every circle of friends seems to have that one person whose best talent is weaseling out of paying their fair share for a meal or who’s always there to ask for favors but never there to hand any out. If you know somebody like that, or if that somebody is you and you’re trying to mend your ways, you’ll want to take a look at Bank of Me by Architechies. Balance Sheet: With Bank of Me, you can see at a glance who owes you money, drinks, meals, and other favors as well as who you’re indebted to. Bank of Me gives you a place on your iPhone or iPod touch to keep track of all of your I.O.U.s. You create accounts—manually or using contacts from your address book—and keep a running log of transactions between you and those people. The app is handsomely designed, from the classic Greek columns in the icon to the conservative wood-panel backdrop to the splashes of hunter green throughout. But as we’ve all been reminded in recent months, an impressive image does not necessarily guarantee a bank’s reliability. For example, setting up an initial “Me” account resulted in several crashes. The ability to create new categories of currency (the defaults are Money, Drinks, Meals, Favors, and Hugs) is a good option, but the steps to do it are confusingly intertwined with a search feature. Bank of Me also allows you to e-mail a balance summary to any of your accounts, but the message it generates is awkward—the subject line is “Are you ever gonna pay up?”, and the message begins with “Hi, deadbeat,” regardless of whether that person owes you or you owe that person. You can, of course, edit that e-mail once it has been created, but there’s no way to change the template. So if you prefer a more polite approach, expect to do a lot of editing every time. 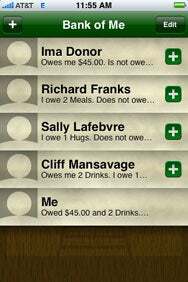 The app does handle its core function competently, providing a place for you to quickly record and review who you owe and who owes you. Use it regularly and it will likely be worth the investment—though your newfound diligence may alienate the moochers in your life. Bank of Me is compatible with any iPhone or iPod touch running iPhone 2.2 software.